In 1894, Baron Walter von Saint Paul-Illaire came upon a cluster of small, fuzzy-leaved plants in what is now Tanzania in East Africa. He had been exploring the area to bring specimens back home to Germany. This simple little plant, Saintpaulia ionantha, commonly referred to as the African violet, now grows in many homes and offices throughout the world today. 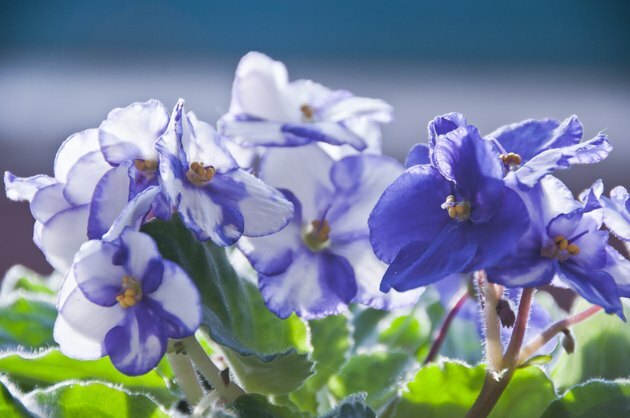 A compact plant with a big impact, African violet satisfies a plant lover's desire to grow without requiring extensive care. Although they are hardy enough to grow outdoors in U.S. Department of Agriculture zones 11 and 12, African violets are grown almost entirely as houseplants. A full-sized plant typically measures 6 to 9 inches in both height and width. With dark green, thick, hairy leaves and star-shaped blossoms of white, pink, purple or blue, the African violet makes a lush, tropical impression in an environment that might be anything but so. African violets prefer nighttime temperatures of 65 to 70 degrees Fahrenheit; daytime temperatures should be in the 75- to 85-degree F range. They prefer light from a north- or east-facing window, but can live in artificial lighting as well. African violets bloom continuously as long as they are healthy. To encourage blooming, pinch off wilted flowers at the stem. Well-drained planting medium is vital when providing African violet care in order for them to thrive in any environment. 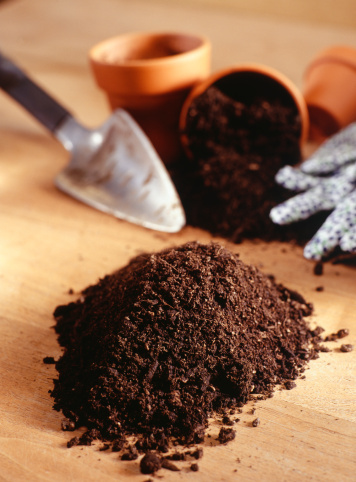 An ideal mixture of 3 parts sphagnum peat moss, 2 parts vermiculite and 1 part perlite will hold the right amount of moisture and give the roots the best ratio of water to air. As peat moss tends to have an acidic pH value, adding a small amount of lime to the planting medium before putting it in the pot will counteract that acidity. When planting, fill the container with medium and place the African violet in the center, aligning the plant's crown to the pot's top ridge. This will give the leaves enough space so they do not rest on the soil. Experts differ on the plant's water needs. Over watering is a common cause of the plant's demise, so many horticulturists recommend watering from the bottom up by placing the pot -- one that has drainage hole at the bottom -- on a shallow tray filled with water and letting the water gradually move its way up through the soil. Although watering the African violet from the top seems straightforward, avoid letting the water touch the leaves, as this will cause leaf spot and weaken the plant's system. Yet another watering method entails inserting a fiberglass wick into the pot's drainage hole and submerging the other end of the wick into a water-filled reservoir for continuous watering. Common problems for the African Violet include pathogens such as Pythium fungi, which cause root and crown rot, and Botrytis cinerea fungus, which causes blight. Pests attracted to African Violet are cyclamen mites and mealy bugs. The best defense against these pests and pathogens begins with basic proper plant care. Any tools or pots that come in contact with your African violet should be disinfected in a solution of 5 to 10 percent chlorine bleach. In addition to avoiding overwatering, ensure that air circulates properly, prevent extreme temperature changes and trim dead or dying plant material. Consider amending the planting medium with diatomaceous earth, the skeletal remains of microscopic algae, which makes the environment inhospitable to soil-borne pests such as mites and mealy bugs. The recommended fertilizer for standard African Violets is a formula that is water soluble and contains almost equal parts of nitrogen (N), phosphorous (P) and potassium (K). Avoid fertilizers that obtain their nitrogen from urea, which can cause root burn in African Violets. Although it is best to follow the directions on the fertilizer label, you can use a diluted solution of 1/8 teaspoon fertilizer to 1 gallon of water each time you water your African Violet to keep them well nourished. Catherine M. Albano has worked in various forms of publishing for more than 24 years as an art trainee, magazine production editor, composition and layout specialist, and project editor. She has written articles for various websites and graduated from Marist College with a Bachelor of Arts in English, concentration in writing. How Much Water Does a Parsley Plant Need?